Production surveillance can extend well life when combined with artificial lift techniques. About 125,000 electrical submersible pumps (ESPs) operate globally in artificial lift applications, producing 60 percent of the world’s oil. These ESPs require significant investments of money and time to install and operate. The health, efficiency and life of these pumps are paramount to the bottom line. Why Invest in Flow Monitoring? Although ESP systems can improve recovery at tired wells, they can also suffer from failures at startup. Production surveillance at the wellhead prevents some failures by confirming the successful installation and commissioning of the ESP system. With production surveillance, operators can ensure the system is the right size for the well. A system that is too large for the reservoir results in pump-off, while a system that is too small will not achieve maximum production. In addition, production surveillance can confirm volumetric flow rates, production index (PI) and efficiency on the lift curve. Most oil wells are not equipped with flow metering. Trailer-mounted well test separators were traditionally used to gauge the production of ESP-powered wells. The separators often performed poorly during operation, resulting in a three- to five-day test duration per well. In most cases, high costs prevent operators from installing traditional multiphase flow meters on each well. Sonar flow meters are an efficient monitoring technology for ESP systems in artificial lift. A sonar flow meter directly measures the flow velocity within the flow line. A multiphase flow engine calculates produced fluid properties and individual phase flow rates. The engine interprets the flow velocity in terms of gas and liquid flow rates, based on properties at the line pressure and temperature conditions where the flow meter is attached. Once the gas and liquid flow rates are determined at actual conditions, the oil, water and gas flow rates are converted to and reported at standard conditions. Sonar flow meters can be installed upstream or downstream of the choke manifold, allowing flexibility in field installation. Wells are tested at fixed flowing conditions or at multiple choke settings and ESP drive frequencies. Depending on the time needed to install and commission the meter, multirate testing of wells can be accomplished in one day. Operators step through several ESP drive frequencies during sonar testing to evaluate the production rate at various set points. The data from the sonar flow meters is used to ensure correct installation of ESPs, to monitor and diagnose performance, to optimize drive frequency and choke settings, and to detect the onset of mechanical failure. This information enables intelligent decision-making in order to maximize oil production rates, influence workover strategies and extend the run-life of ESPs. Table 1. 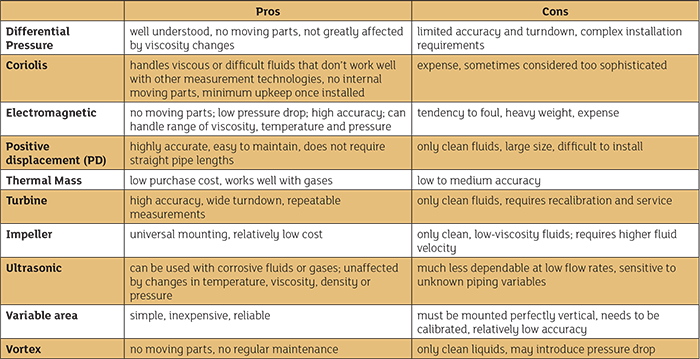 Flow Meter Cheat Sheet: Pros and cons of common types of flow measurement technology. To see a text version of this chart go here. In Iraq, much of the wellhead infrastructure and surface equipment is aging and in need of repair. An aggressive reinvestment campaign aims to replace infrastructure in the country. Changes in the oil market have left operators seeking cost-effective ways to enhance existing equipment. A local field operator was challenged to continue oil production while leveraging the current infrastructure. Many of the wells in the region’s fields produce hydrocarbons from both the tubing and annulus and are equipped with a nonreturn valve (NRV). The NRV balances production between tubing and annulus and prevents recycling back down the annulus. was placed on the production wing flow line upstream of the choke. The relocation of the sonar meter enabled the technician to observe and conclude that the NRV—on the casing flow line upstream of the choke—could be leaking and that the well was flowing from the tubing into the annulus. The meter was relocated from the on-production wing flow line to the casing flow line, where a flow rate was measured in the reverse direction. This confirmed earlier suspicions that the NRV was leaking and the flow was cycling within the well. The operator used the flow meter data to diagnose the failure of the NRV and take remedial measures to protect the ESP system and avert costly workover. Suha (Sylvia) Haidar is a sales and marketing professional and has spent six years with Expro Meters. For more, visit www.exprometers.com.